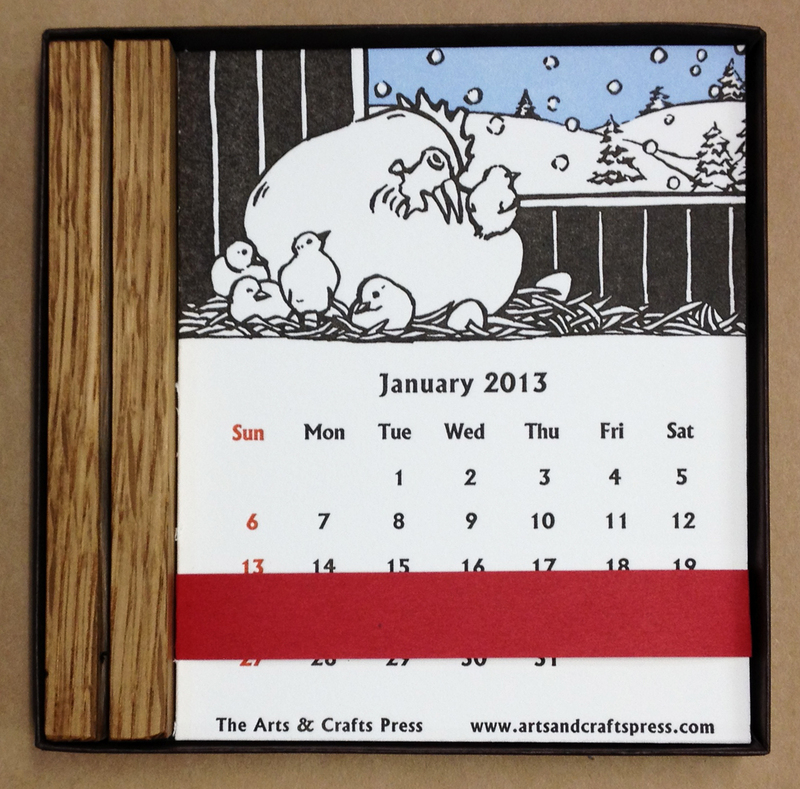 Welcome 2015, PBS “Craft in America” & Letterpress Renaissance! 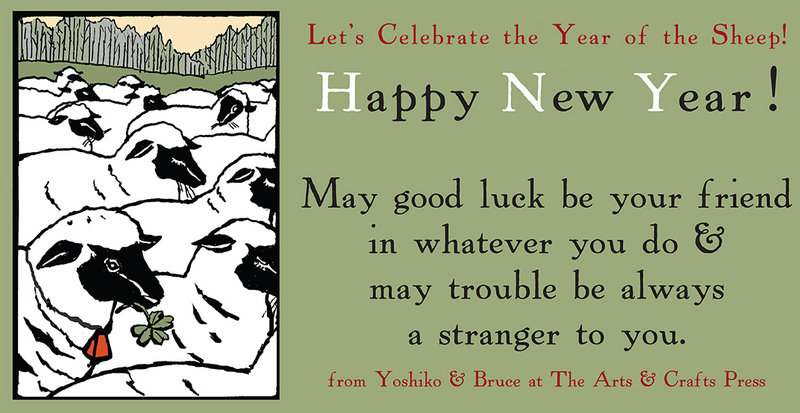 2015. . . Born in the year of the sheep, I’m excited about this auspicious new year. . .
As I write this blog, I’m eagerly looking forward to a visit by the film crew from PBS’s Peabody Award-winning series “Craft in America,” a wonderful educational TV program that features iconic figures known and respected for their art and craft. The executive producer Carol Sauvion and her team will arrive at our studio in Tacoma this Saturday. They are going to film our work process from sketching, everything from carving blocks, making polymer plates, to printing on our letterpress printing presses. 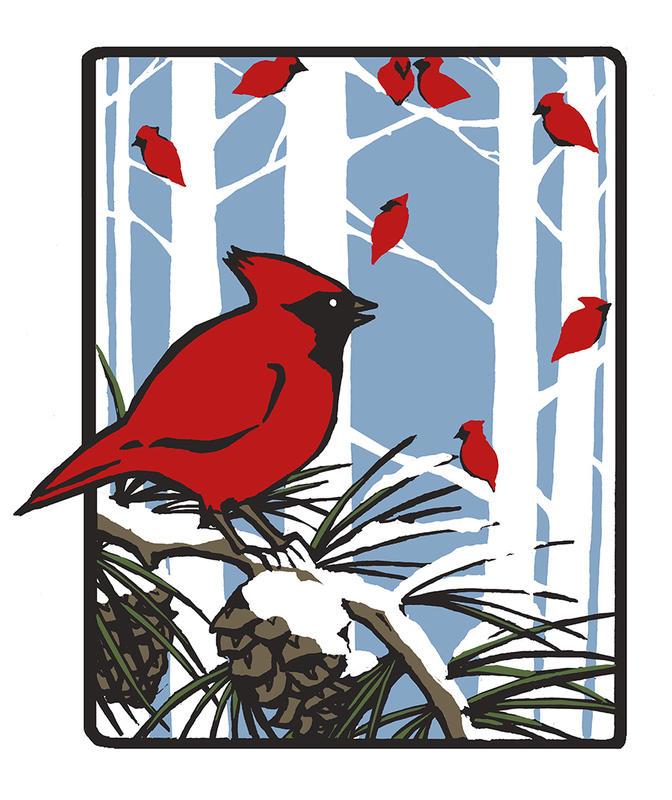 I’ll be making a special new note card “Winter Cardinals” for this PBS show. But looking back on the year past, I must confess I’m so glad we’re done with 2014 and that 2015 is here now. Last year was a year of change and transition. I do appreciate good changes, but even as good as they were, there were way too many. We first moved our home to Tacoma, and spent months searching for the perfect studio space. 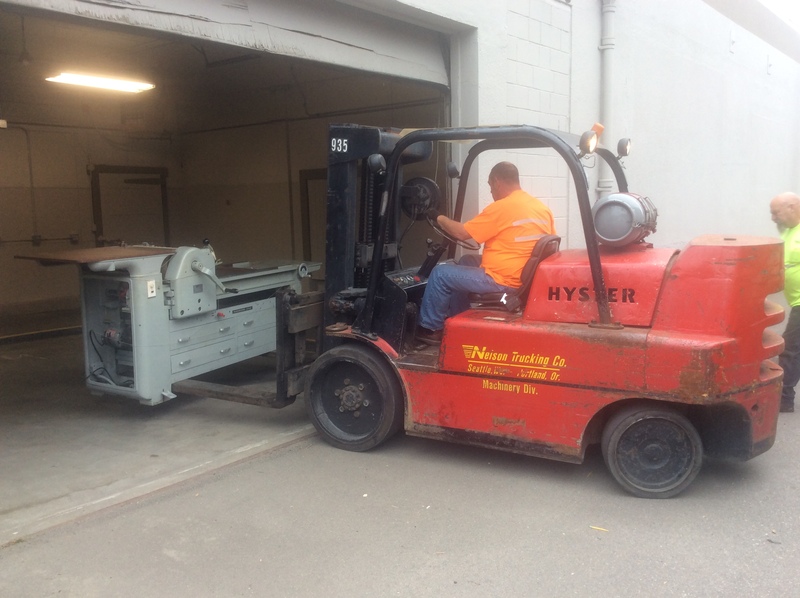 After signing a commercial lease for our new studio, we spent months gutting out the debris, building a showroom and kitchen, cleaning, painting, adding shelving and storage and replacing broken windows, finally reaching the day we were able to move our antique printing presses. Somewhat “shellshocked” from all the change, now I can look around our surroundings with a smile. Yay, we survived 2014! I really love our new studio space. Compared to our former home/studio in a small town of Port Orchard –a large suburban house with a two-car garage (which served as our pressroom for the last decade) — the new location is nice and airy, zoned commercial, and perfectly laid out for a small letterpress-printing business. But part of me sorely misses the quietude, the gentle breeze and sunlight, the trees and birds of our old home/studio. I fondly remember the time our backyard hens forced open the sliding door and marched inside to see what we were up to that day. A raccoon family often came and lazily hung around in our enormous maple tree. Our children used to race to eat cucumbers and peas as they matured in our backyard. But even without those pleasing natural elements I have to say that the new studio space is quite functional and wonderful. With ample room we can work comfortably without bumping into each other. 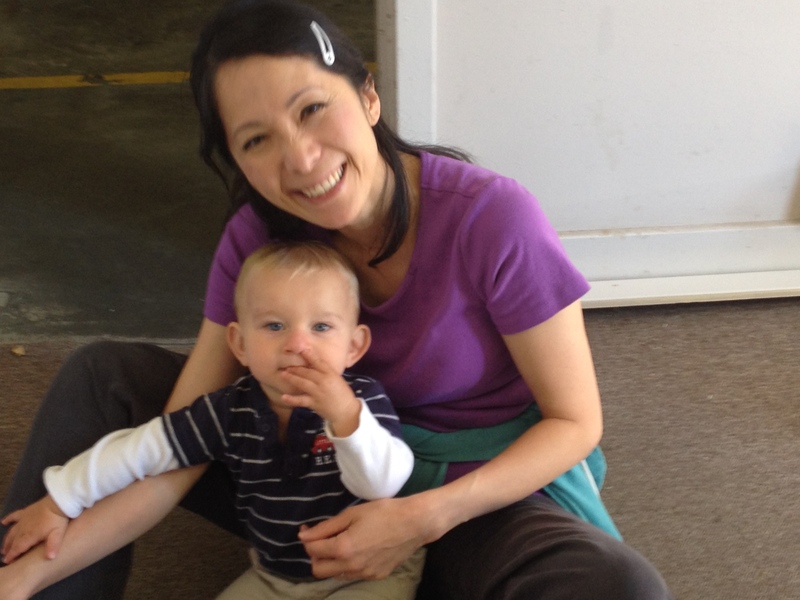 Now that our studio is open to public, occasional visitors come by. I enjoy giving a quick tour of our old printing presses. “This one is our real workhorse, Heidi, she was built by German press makers and I have to say this prints more than 100,000 note cards a year for us. And that ‘Old Gordon’ is so beautiful, don’t you think? Look at the curve on the flywheel. . . But all these presses have one thing in common. It’s a relief printing process where raised area of the block receives theink for printing. ” I LOVE using and learning to use these old presses, some dating back to the 1890s and our newest one is from the 1950s. 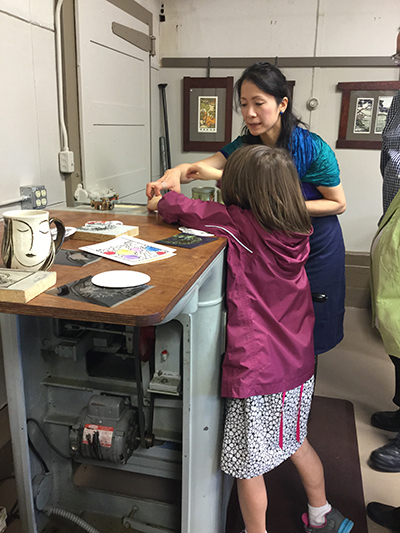 Often our visitors are amazed to find that we actually use these old presses to print all our note cards and block prints. With prevalence of digital printing, giclee, color copies,and offset printing, it is understandable. Why do people like me use old presses to print, when newer technologies are available? 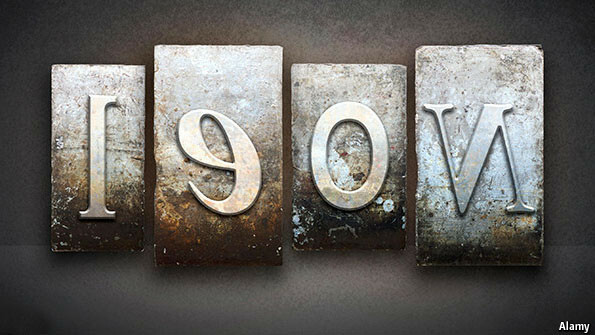 Why do we letterpress today? In a nutshell, the article describes the two chief reasons for the rebirth of old letterpress printing. One is that younger generation got “digital fatigue” and they’re looking for “individualized products and hands-on experience”. Hear, hear!! Enough screen time, enough scrolling!! They want real sweat, smear, and smudge. I can relate to that!! Another reason is that paradoxically computers helped save the dying trade of letterpress printing and helped spread its popular appeal. 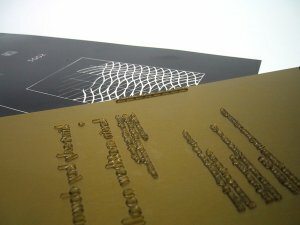 Rather than learning the craft of setting metal type to print, now we can compose sentences in the computer and make a polymer plate to print from. I use both hand-carved blocks and polymer plates for our work at the Press. The polymer plates are durable and suitable for our note card production as we usually print as many as three-thousand note cards at one time. Linoleum blocks won’t last more than 200, 300 imprints and so I use them for our limited-edition prints. As William Morris said over a century ago, my goal is for us to be “the masters of our machines and not their slaves,” to find the balance between our hands and machine. I think this quote is not relevant just for us printers. I think it’s relevant for woodworkers, textile artists, factory workers, writers, cooks, homemakers, office workers, medical professionals, store clerks, janitorial workers, and all humans who work. And so here I am, in my new studio, carving a new linoleum block and taking breaks to sip tea and type this blog entry. Often I think of the age-old question. . . how do we make our work pleasurable and meaningful, not just for myself, but for all of us who work at our studio? I hope your new year will be a great one too! As a cat has nine lives, my designs have many incarnations. It’s fun to trace their transformations or mutations. So here is the chronology. 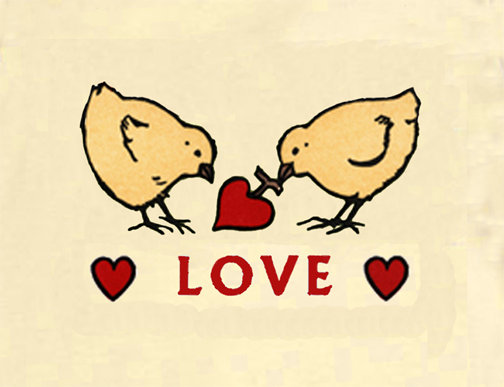 I first designed this “Love Chick” image as part of our 2013 Chicken desktop calendar pages. 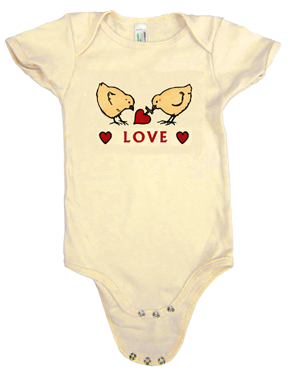 The “Love Chick” was a February (Valentine) design, with one baby chick giving a heart-shaped leaf to the other. We had four wonderful backyard hens then. 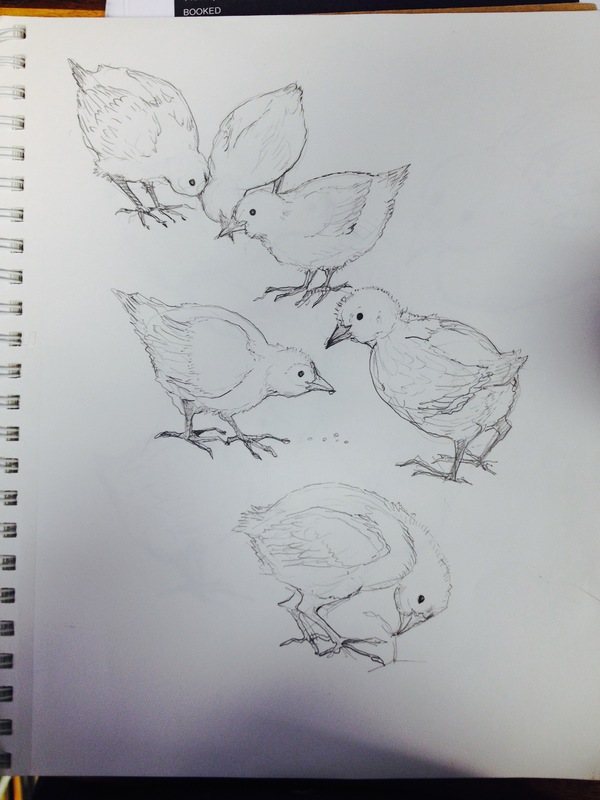 When the chicks were still a few weeks old, they loved to play with small twigs and leaves outside. 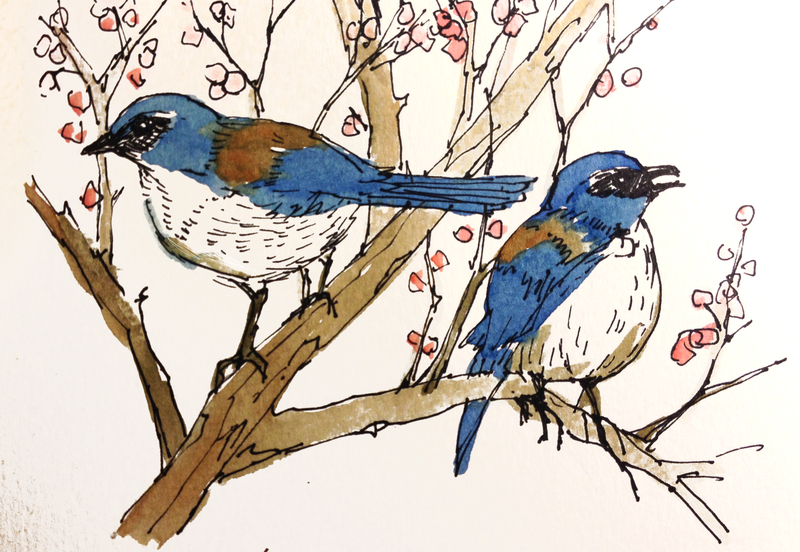 They were adorable and perfect little models; I made many watercolor sketches. 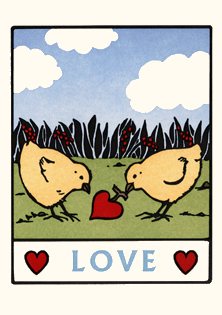 My chicken obsession continued and the calendar images became a set of “mini chicken cards” which were then sold out immediately. 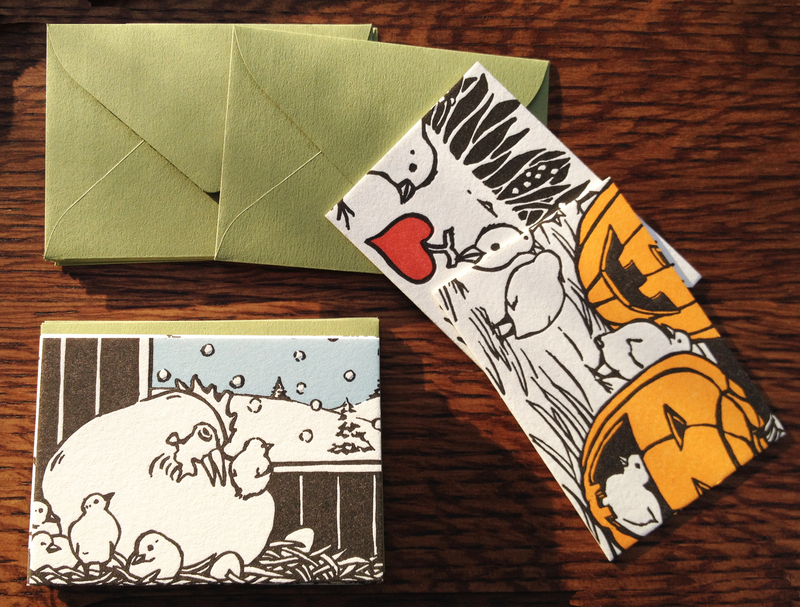 I still couldn’t get enough of the chick image; I decided to add a few more colors and make a full-fledged letterpress card. And now I’m thinking to try this image on a tea-towel or a mug. . . peep, peep, peep. . .
Our family attended this event last year. My then-six-year-old daughter is usually shy, but on the night of the “From Hiroshima to Hope” event last year, she was ready to volunteer. She jumped into the lake water and helped hundreds of participants float their paper lanterns. I was also inspired by this beautiful gathering and so when I got home, I created a few watercolors. Then I decided to turn one of the watercolors into a blockprint. As I worked on this print, I kept having a question: Why do I make a block print of watercolors? Obviously this is how we block printers often work. While carving away the linoleum (fun, but laborious process), the same question kept coming back: Why do I make prints from watercolors? It took me weeks (besides other things I’m trying to get done daily) to carve this linoleum block. Then it took another few weeks for me to work on color separations, make polymer color blocks for all the colors, and prepare the proof copies before my assistant and I were able to begin printing 180 copies of the print. But then my sense of doubt was all erased when we began printing. As my children like to say, printing is like magic! It’s when all the details and layers become fused into a cohesive whole. And the process of printing is so tactile and full of visual rewards. Every layer of colors adds depth and nuance to the print. Here (below) you can see how the print looks after the first six colors being printed. Plus with the block print, the colors are more definitive than watercolors. The shapes and lines become simplified and cleaner. And the composition is more refined. When I finished printing the last color and saw the completed blockprint, I felt a sense of relief. For the last two months while I was working on this new print, I felt as though I’d been swimming under water, holding my breath, thinking and imagining how all these blocks and colors come together to make one print. 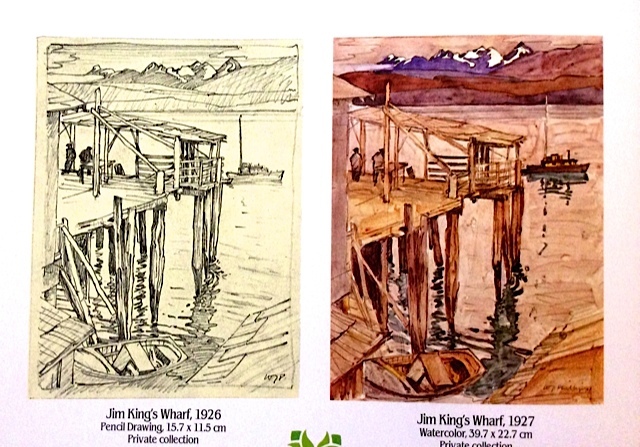 Below you can see another example of this transformation from a pencil sketch, watercolor, and to a block print, made by Walter Phillips, a well-known Canadian block print artist and watercolorist. For my “Peace Lantern” print, I ended up using 14 blocks. We used 100% cotton Rives BFK paper, mold-made in France. 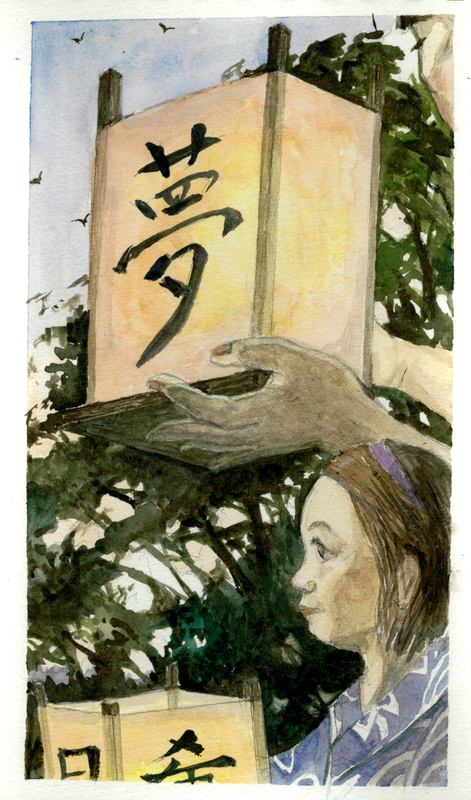 Fifty copies (numbered from 1 through 50) have been donated to “Hiroshima to Hope” event organizers to raise funds for their annual event. 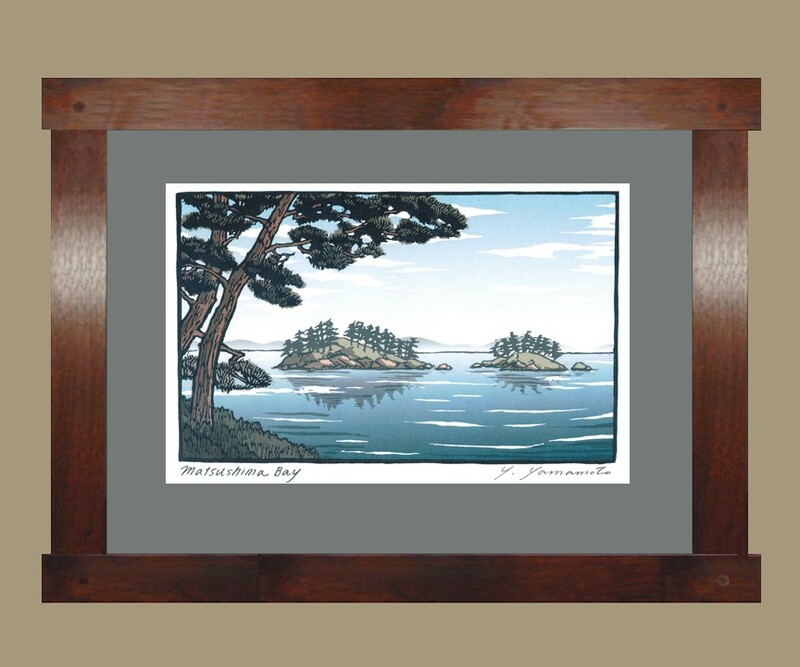 To find out more about this print, please visit our website http://www.artsandcraftspress.com/BigPicture.asp?catalogid=462. 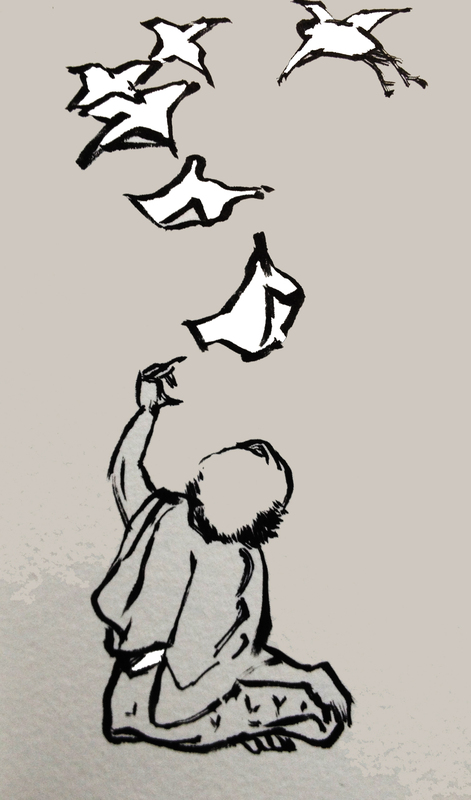 And to find out more about the “Hiroshima” event, please visit http://fromhiroshimatohope.org. It is spring. Migratory birds are coming back to our northern skies and I’ve been thrilled to watch them return. This week in particular the chirping of birds have gotten varied and louder, sounding nearly feverish at dawn. There’s nothing like their happy (sorry for my anthropocentric description, but they do sound quite happy) chorus — chitter-chatter, gurgling, cheep-cheep, tweet-tweet, pip-pip. At least to my ears they sound so excited and exuberant. 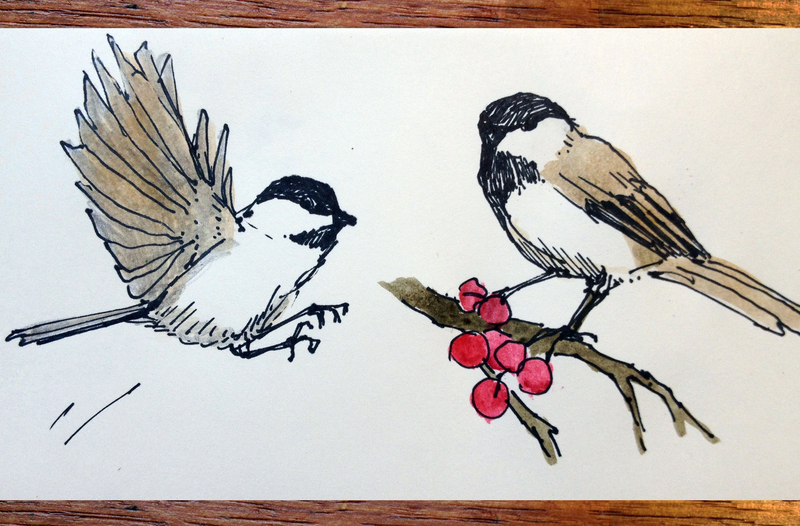 I enjoy drawing birds. 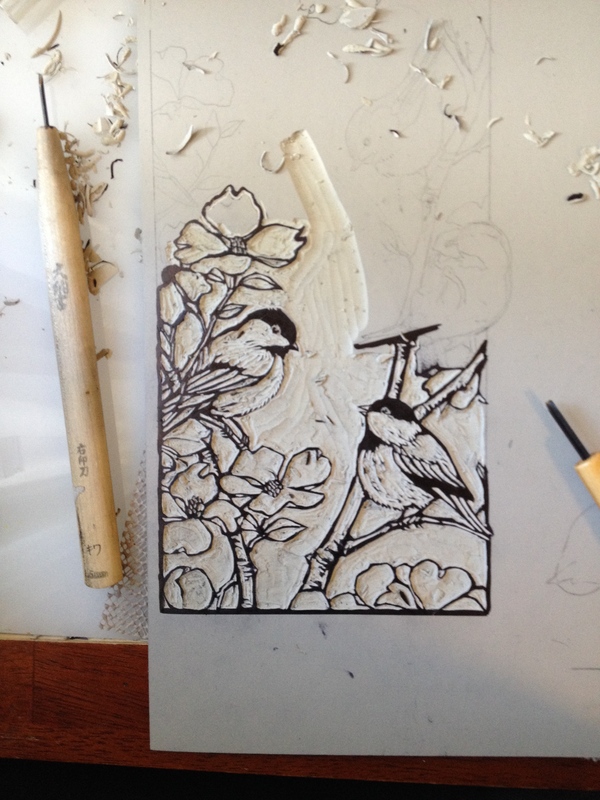 Right now on my desk sits the chickadee carving for my new print. 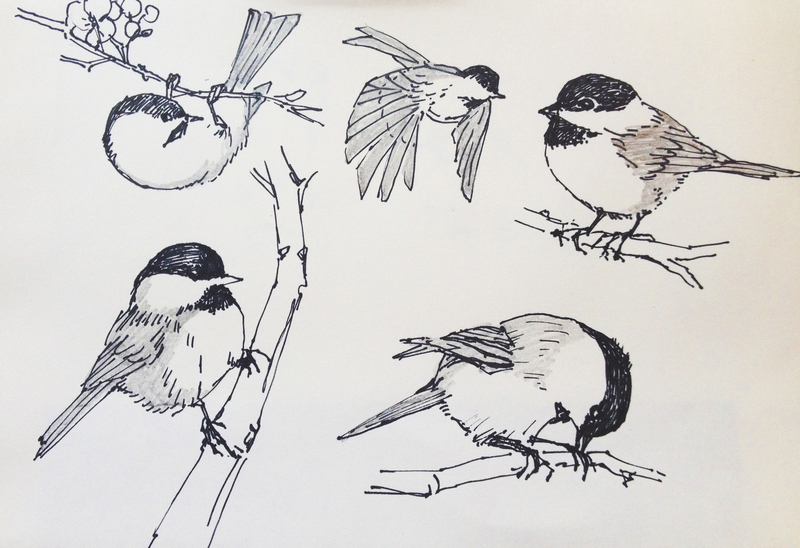 Chickadees are curious, friendly little birds with a cute black-cap and white breast, about the size of a large egg. They jump from branch to branch, hanging here and there; they’re a natural acrobat. Recently I caught what my husband calls “a bird fever”; it is like the spring fever. I am just obsessed with birds. I have the urge to learn about them. I wanted to learn beyond American robins and stellar jays. Just imagine my excitement when I spotted a couple of bluish looking birds (the size of American robin) and could intelligently say that they weren’t stellar jays, but they were Western scrub jays swooping down from the cherry tree. I’ve been seen walking around the backyard with my I-phone app for bird call identifications. I attended an Audubon meeting at a local library. I bought books on birding. I’m trying to act like a birder, but honestly I have to say, I’m not even a fledgling birder. I’m more of a nestling, or should I say I’m basically a hatchling birder at this stage. Since I love music, I am particularly interested in the sounds they make. Birds sing just as we humans use our voices to communicate. Bird calls are varied and functionally specific, such as “Come here, darling” (a mating song) “Keep out!” (territorial signal) “Danger!” (alarm call). A male sings more often than a female as their singing is often a gesture of courtship. The length of the male birds’ songs correlates directly to his popularity. Sure, so far these all sound pretty much a common sense. But it gets more interesting here. Why do they sing so loudly at dawn? Louder than other times in the day? Have you noticed? We humans really don’t seem to know why. . . why they sing at dawn, so much louder than the rest of the day? Or simpler yet, how do they sing so well, I wonder. How do the little birds produce such pure tones with such ease, out of that tiny body? 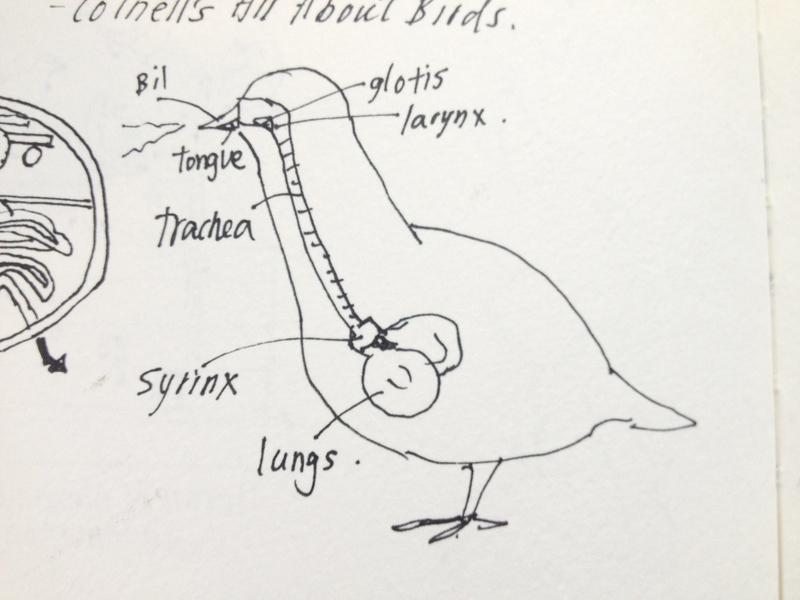 I found out that birds don’t use larynx for their voice production. They use syrinx instead. Is it the perfect placement of sound traveling through their small bodies into their tiny head cavities that enable their perfect voice production? As an amateur soprano myself, I admire these small backyard singers’ remarkable abilities. Fascination with birds is boundless. 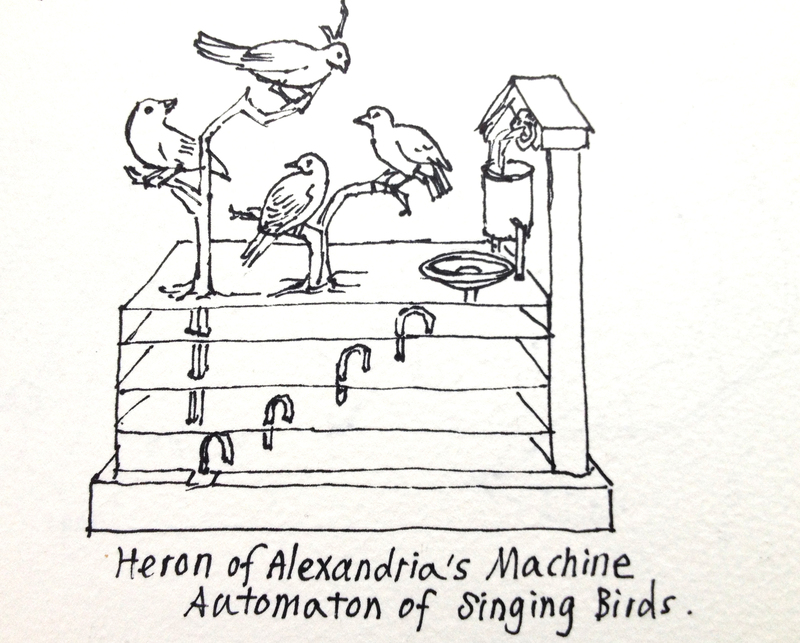 Over the centuries and across continents — from the ancient Greece and China, to Victorian America, humans tried to capture these wonderfully musical creatures on earth by making bird automatons. We humans have the desire to replicate the delicate songs of the birds, but it is like trying to count all the stars in night sky. Inevitably bird songs have inspired music composers as well. 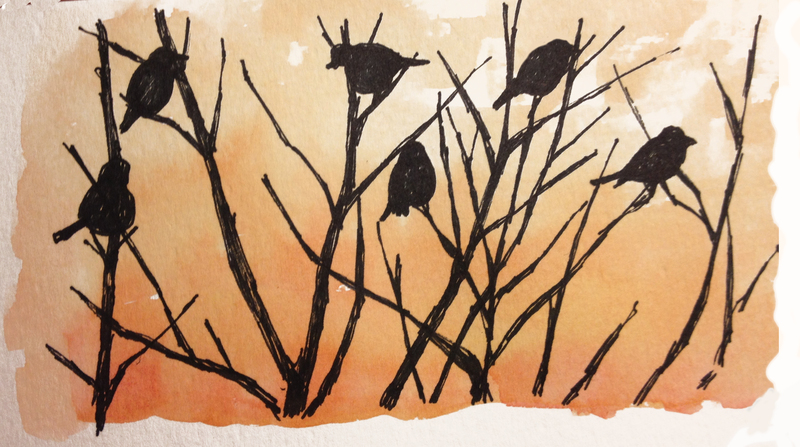 Songs inspired by birds are everywhere, from folk songs, classical, to pop music. From imitations of bird sounds (like cuckoo), to the pastoral sounds depicted by the call of a lark, we have a rich legacy of “bird inspired music.” I am compiling a list of bird-inspired music right now, but the list is endless. Just to name a few of the classical music composers, Vivaldi, Handel, Mozart, Beethoven, Edward Grieg, Saint-Saens, Berlioz, Benjamin Britten, Messian. It goes on and on. Flute, piano, violin, and soprano voice, among others, have been used to portray their brilliant whistles and songs. It is spring, dear friends. I hope you get up early in the morning, walk outside and enjoy the beauty of their songs at dawn. Some of the migratory birds will be gone in a few more months, so now is the time to listen to their songs. Not a morning person? Hmmm. . . Just try it once; the reward is for you to discover! How do we go on after a catastrophic event like a loss of a loved one or a massive hurricane or a tsunami ? At 2:46 pm, all throughout Japan, peace bells rang and citizens– old couples, office workers, to school children–bowed their heads in silence. Three years ago yesterday in Japan, the 9 magnitude Tohoku Earthquake hit the Northeast region of Japan and the massive tsunami took over 15000 lives. 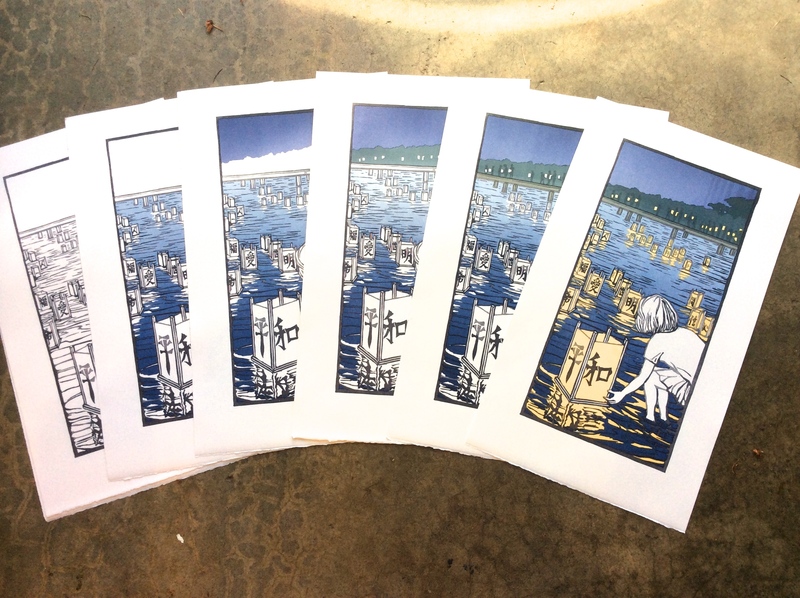 When this tragedy happened, we teamed up with an emergency medial relief team called Empact Northwest; I made a block print of the Matsushima Bay (once a beautiful bay in the Tohoku region) for a fundraiser. Together we were able to donate over fifty thousand dollars to the recovery effort. Today in America (3/11) marks exactly three years since the earthquake. 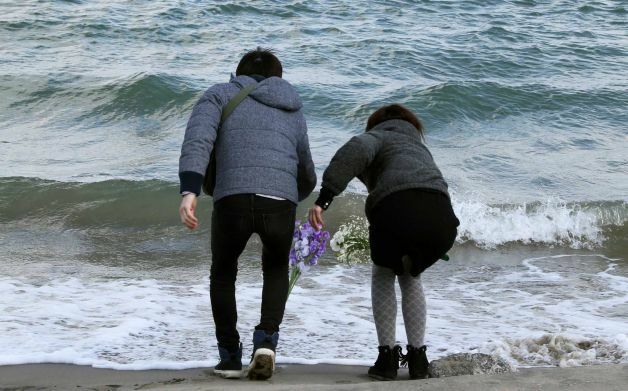 Still over 2600 people are missing and with the ensuing problems at the Fukushima Daiichi Nuclear Power Plant, the area continues to struggle with the post-disaster recovery. Currently the Japanese government shut down all 48 nuclear power plants for safety inspections, with a future plan to resume their operations. Japanese citizens’ anti-nuclear sentiment has been rising. On March 9th, many protesters took to the streets in Tokyo — rather an unusual spectacle in Japan where group conformity is still important. They argue that Japan needs to stop using nuclear power and instead look into alternative energy source such as geothermal (which is abundant, constant, and promising! ), solar, and wind. A group of about 100 men and women also staged a protest in front of the Ministry of Economy, Trade and Industry. 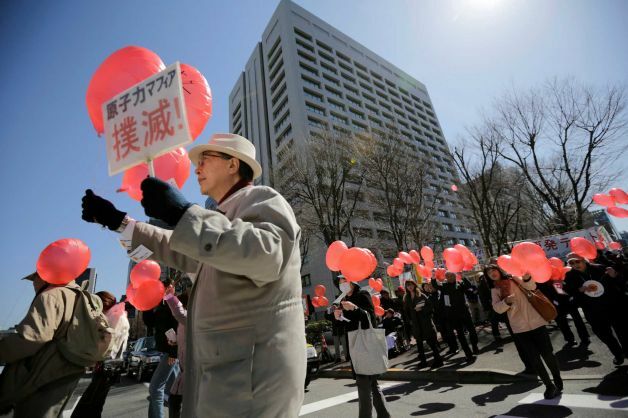 They released 300 red balloons with the words “No to nuclear power” in Japanese. A perfect peace message for an insular government headed by Prime Minister Abe who seems to lack the awareness of international political sentiments. This year I’m planning to release my own “red balloons” into the Seattle sky. Not during day time like the protesters in Tokyo. But it’ll be at night. A group of Seattle-area volunteers have been staging an anti-war and anti-nuclear weapons ceremony and event called “From Hiroshima to Hope”. 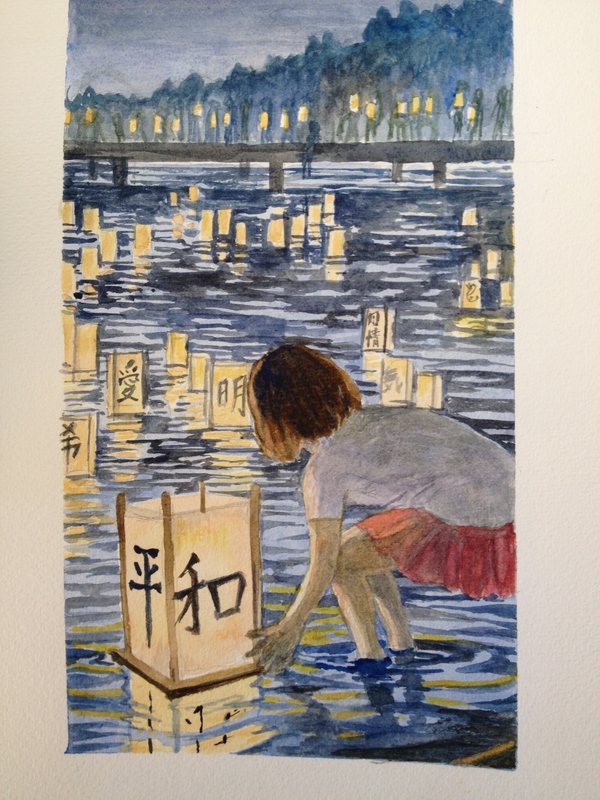 At Green Lake in North Seattle neighborhood, they invite thousands of attendees to make a paper lantern, write their messages with a brush and ink, light a candle inside, float them into the lake. My husband volunteers for this event and our kids and I participated last year. The experience of floating over 1000 lanterns into the dark lake water was moving and mesmerizing. When I returned home, I made a quick watercolor sketch. 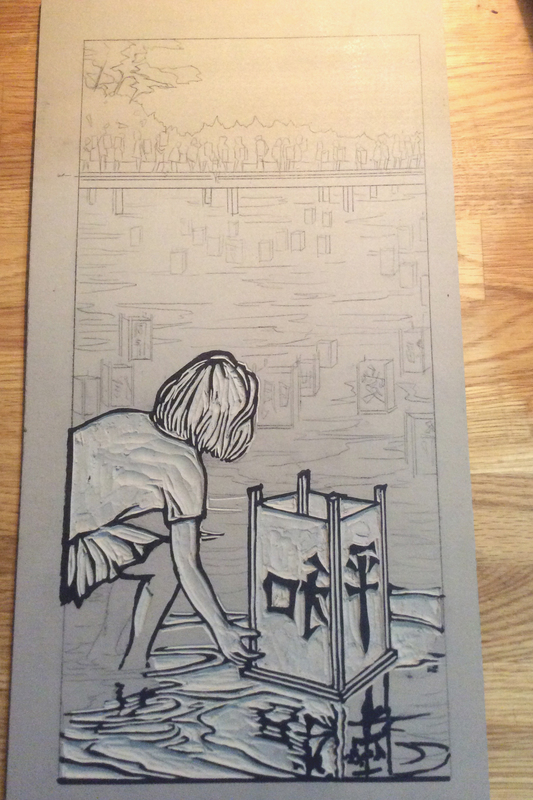 Using this sketch I’ll be making an original linoleum block print for the 2014 “From Hiroshima to Hope” poster. Just like the red ball0ons in Tokyo, our paper lanterns will be filled with our wishes and hopes for a better world, a better future. For the past few weeks, I’ve been designing a set of 6 cards for the next season. Three are new holiday cards and the rest are a set of three quote cards that are adapted from my designs for the Wisdom of Trees prints that originally were commissioned by American Bungalow magazine in 2012. 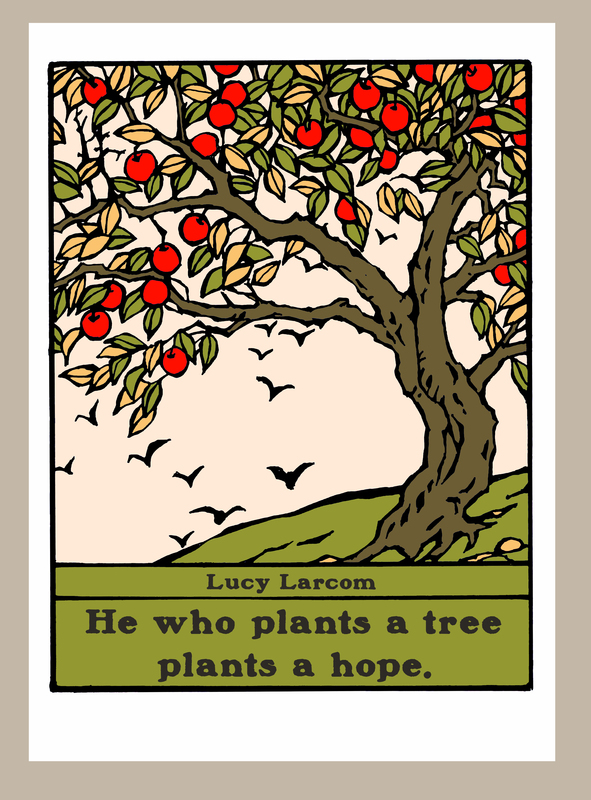 Today I finished drawing and designing one of the quote cards, “Plant a Tree”, based on a poem by Lucy Larcom. 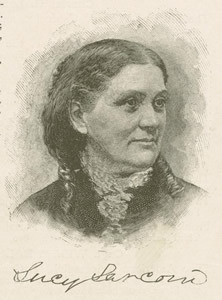 Known today for her memoir A New England Girlhood (1889), Larcom was a widely published poet, teacher, and an abolitionist. In this book Larcom recorded the lives of New England girls who were working at textile mills in Lowell, calling attention to the dangerous conditions of factory work. It is a vivid account of the fast changing lifestyle of workers from agrarian to industrial age in America. Larcom’s phrase “I defy the machinery to make me its slave” still resonates today. Here at the Arts & Crafts Press, we use both our hands and machinery. 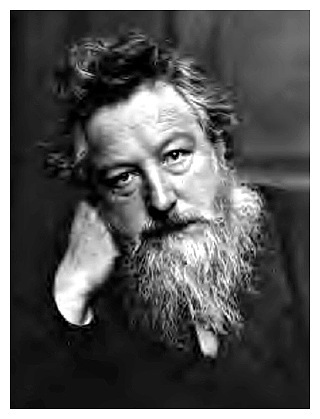 Just as William Morris advocated in his writings over a century ago, we’re trying to find a good balance between the use of our hands and machines. As I write this, my assistant, Rachel, is printing our note cards using our 1951 Heidelberg letterpress printing press. And on my worktable is a unfinished linoleum block for the next print, “Banditry of Chickadees”. The goal for us is to find the pleasurable balance between machinery and handwork, in order to offer our note cards and prints at an affordable price while keeping our quality. Below is the entire poem “Plant a Tree” by Larcom. Enjoy! 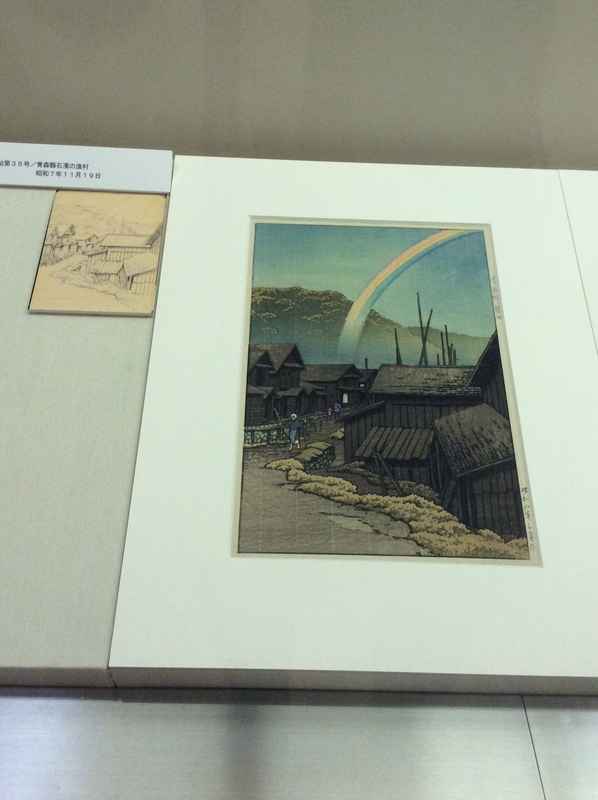 Hasui Woodblock Exhibits for the Enthusiasts! 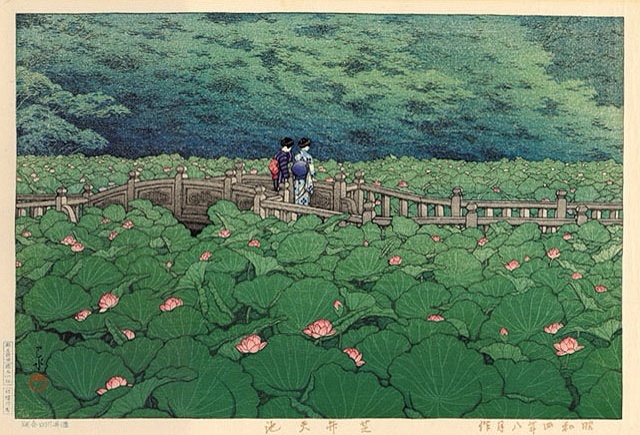 Shin-hanga artist, Kawase Hasui’s woodblock prints are simply beautiful. Some might say they are nostalgic, but they are all executed with impeccable draftsmanship. I have been a big fan of his work for years. This year marks the 130th years since his birth and in order to commemorate this, two museums in Tokyo are having major exhibits of his work. Hasui lived his later years in Ota ward and so this ward is the depository of his papers, sketches, watercolors, and the woodblock prints that were printed by Watanabe Publishing house. 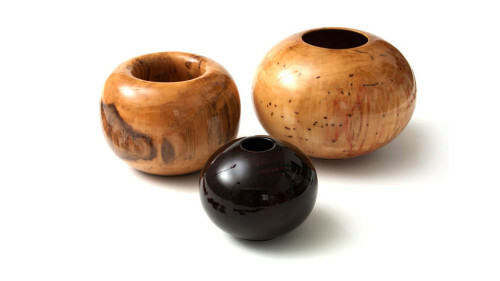 The Ota Museum has planned a three-part exhibit: the first one focusing on his work through the 1920s, the second one covering the period from the Kanto Earthquake in 1923 into the 1930s, and the third one from 1930s through his later years. A good ten-minute walk from the Minami Magome station, the Ota Museum building is an unassuming modern concrete building. But once inside I was immediately amazed by the quality of the items on display. 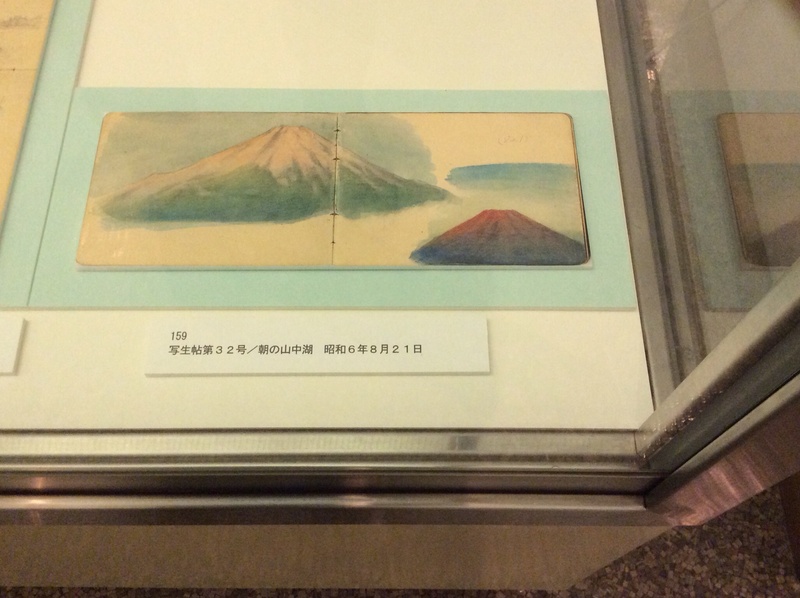 The glass cases were filled with Hasui woodblock prints and, not only that, the prints were arranged carefully next to the pencil sketches and watercolors he had prepared for each print. I had read before that late in his life, due to a fire, Hasui lost most of his original watercolors and sketches. I had never thought I would be able to see so many watercolors of such astonishing quality by him. 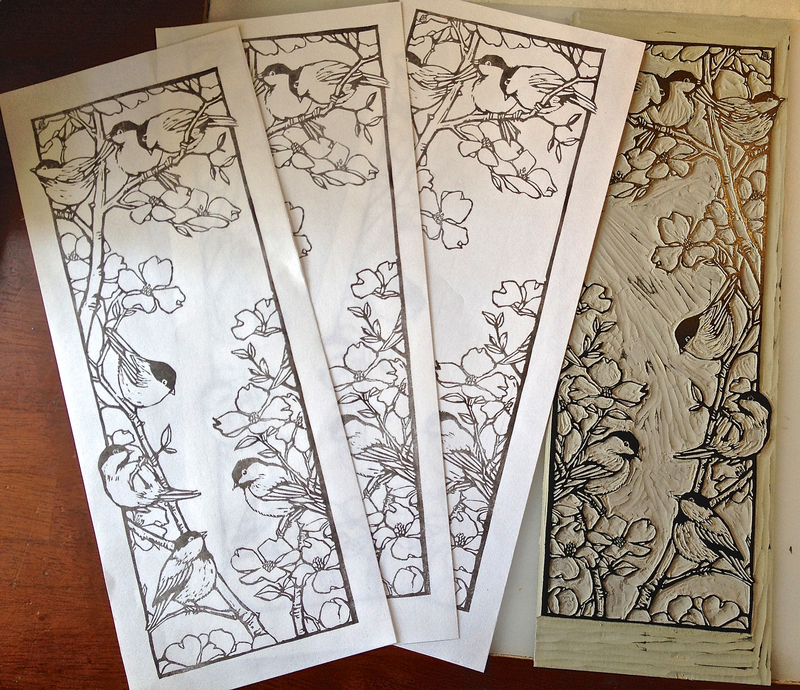 As a block print artist, I am familiar with the process of making woodblock prints. Being able to examine first-hand various stages of Hasui’s work — from rough sketches to final execution, was a real treat for me, and I believe will be for many others. Especially I enjoyed viewing how he studied and sketched parts of the buildings, trees, and townscapes, first with pencil, then in watercolor. As artists, we’re constantly trying to achieve a harmonious composition — we eliminate unwanted details, rearranges compositions, find motifs, create patterns, adjust colors, so that the final work will hopefully achieve the balance we wish for. 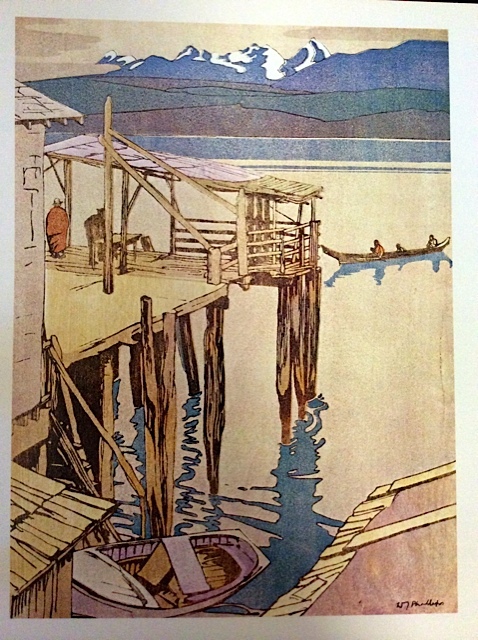 One might be tempted to ask which he/she prefers — Hasui’s watercolor sketches or the finished block print. Without question there is undeniable perfection and beauty in the finished woodblock prints executed by the Watanabe publishing house based on Haui’s sketches. Compared to the prints, Hasui’s sketches look unfinished and raw. But the real value of these sketches lies in its ability to reveal this artists’ process of work, his skills, and his mind at work. The exhibit will be on until March 2nd and I hope many people can have the opportunity to see this wonderful exhibit. For those who cannot make it to Japan this winter, the Museum produced a very comprehensive color catalog of the three-part exhibit. It includes all the images that are on exhibit. 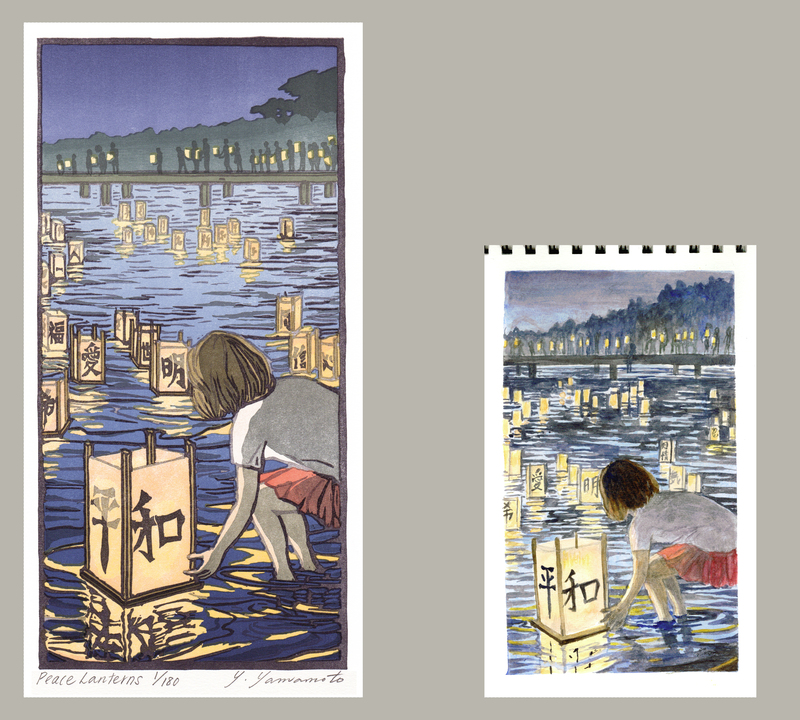 But I must say that there is absolutely no comparison between looking at the printed catalog pages and seeing the actual sketches and woodblock prints. Nuance and immediacy are gone in these catalog pages. If you really want to look into the artist’s process of creation, then I recommend you hop on the airplane to Tokyo today! You can also visit Watanabe Woodblock Gallery in Ginza, Tokyo, to view and purchase newly reproduced woodblock prints and other “shin-hanga” artists.